There’s no stopping George Eiskamp, MPIA ’03, once his mind is made up—even if the job offer is thrice higher. 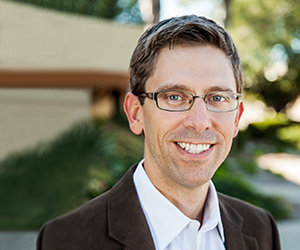 The alumnus’s career took a turn even before graduating from the UC San Diego School of Global Policy and Strategy (GPS), when “against advice from everybody—professors, family, friend and mentors,” he turned down a position in banking to instead gain experience that would, hopefully, lead to a career in entrepreneurship. Fast-forward 13 years and, as the CEO of GroundMetrics, Eiskamp is enveloped in entrepreneurial success. In a nutshell, his San Diego-based startup developed a technology that images geology. Using electromagnetic sensors to identify pockets of oil, water and gas, the technology allows drillers to make more informed decisions of whether and where to drill into the ground. While Eiskamp didn’t exactly have oil and gas in mind when he envisioned himself leading a company—and has nil formal training in geophysics or engineering—he credits much of what he learned at GPS for being able to learn the ropes and persevere in the space. Most importantly, Eiskamp is getting the return on investment he anticipated from his education: the opportunity to make an impact. As a Presidential Management Fellow, Eiskamp landed an internship at the Export-Import Bank and later at Wells Fargo & Co. But instead of boosting his enthusiasm for joining a large organization after graduation, these experiences made Eiskamp question how much change he could create within a large bureaucracy. Entrepreneurship, he understood, was a route to make an impact fast. This steered Eiskamp to apply to consulting firms, with hopes of building skills that piggybacked off of his management track at GPS. “I knew I didn’t have a skillset that would be of much value to a startup at the time, and I didn’t have any business ideas myself,” Eiskamp recalled. All the while, his applications submitted to big banks were already under review. Accepting the position as a business analyst with Bainbridge Inc. was his first step in an entrepreneurial direction. Years later, after more stints in consulting and management, Eiskamp’s career by happenstance had traversed several sensor-based companies. 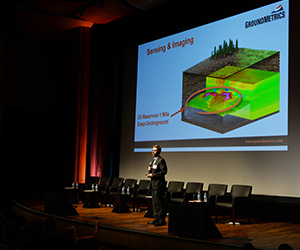 By 2008, he was CEO of Quasar Geophysical Technologies, which developed for the U.S. Department of Defense the technology licensed exclusively to GroundMetrics today. Eiskamp founded GroundMetrics as a spin off from Quasar five years ago. Since then, he’s learned a bit about what it takes to be an effective leader. Unsurprisingly, this responsibility is also what Eiskamp finds most rewarding as a CEO. “Having the freedom to identify what’s the most important thing I can do for the company on a daily basis, that’s the most satisfying,” he said. Still today, Eiskamp says GPS courses such as macroeconomics and policymaking processes are handy in terms of, respectively, navigating international business deals and how decision-making processes are conducted across different organizations. But, he clarified, that just scratches the surface. Adding to these skills, Eiskamp also has developed a knack for fundraising over the years. Conducting six rounds of financing for GroundMetrics to date, Eiskamp placed second at San Diego Venture Group's PitchFest; placed in the top three for the Angel Capital Association's Luis Villalobos Award and has set two records with the Tech Coast Angels, the U.S.’s largest regional angel group. Under his leadership, GroundMetrics also has received grants from the U.S. Department of Energy, among other government entities. Albeit his impressive track record, Eiskamp admitted fundraising is not a favorite part of his job because “it takes a lot of emotional energy.” No less, it’s another testament that when Eiskamp puts his mind to something, there’s no stopping him. Considering what’s on the horizon for GroundMetrics, the modus operandi is clearly paying off.